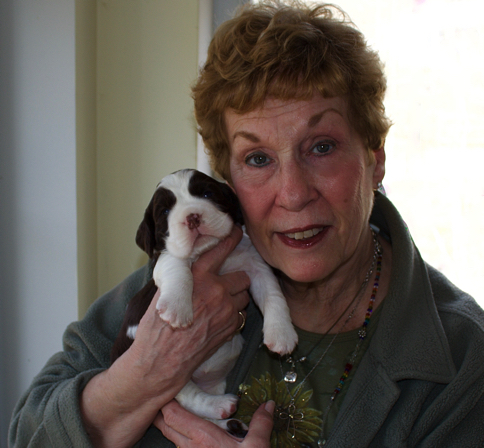 I am a breeder of English Springer Spaniels (ESS) and belong to the Eastern ESS Association. Each litter is registered with the American Kennel Club (AKC). I have been breeding Springers since 1996 and have many very happy adoptive families. Springer Spaniels are an outstanding breed for pets and these are top quality dogs. They are bred from show dog lines and make great pets. Springer Spaniels are a gentle loyal breed. Simply send in the forms to register your purebred puppy. English Springer Spaniels are a Sturdy gun dog, with a good natured vitality that makes them excellent companions. Springers were originally grouped into a diverse group called "Land Spaniels" which eventually were divided into distinct groups, the larger types were named Springers. They were used to "spring" game for falconers. This work required great stamina along with a keen nose and an inexhaustible interest in flushing birds. With the introduction of the gun, the breed's role changed and it was required to retrieve the birds as well. They are willing and affectionate dogs, and do exceptionally well with children. A happy spirit. Springers are essentially a country dog, although they can adapt to urban life with adequate exercise offered. Their coat needs regular grooming. Check the puppy page for information about the puppies, then call us and come see them in person.